Like many Americans, our Thanksgiving traditions include watching the Macy’s Thanksgiving Day parade in our pajamas while eating pumpkin pancakes, spending hours traveling to family for the Thanksgiving dinner, watching football in between courses, and then planning the countdown to the holidays diet that we attempt to start on Black Friday but doesn’t really start until Giving Tuesday. Growing up, my Aunt would host a Thanksgiving feast featuring all the traditional Thanksgiving foods: roasted turkey, cranberry sauce, stuffing, and pumpkin and pecan pies for dessert. When I married my non-American husband, our first Thanksgivings with friends resembled the traditional Thanksgivings of my childhood. But as our cuisine and tastes have changed over the years, we decided it was time to put a modern twist on a traditional Thanksgiving menu. Borrowing primarily from Asian and Mediterranean influences, we infused them into some of my favorite Thanksgiving dishes. So our food looks like traditional Thanksgiving fare but with explosions of new flavors that are absolutely delicious. If you’re interested in trying something new this Thanksgiving, check out some of these modern foods that will transform your traditional Thanksgiving feast. They are sweet, tart and bubbly! And it’s a perfectly acceptable reason to pop the cork on a bottle of champagne on a totally random Thursday evening. Life is too short to wait for special occasions. Plus, a 2-ingredient drink makes it super easy to share with guests! This is a pumpkin dish perfect for the season! Made from roasted kabocha, or Japanese pumpkin, whipped into a creamy soup with sweet potatoes and miso, perfect for a traditional Thanksgiving! This recipe uses mushrooms in place of the pork, a cheeky reference to green bean casseroles that is a powerhouse of salty, spicy and funky! Refreshingly sweet, tart and tangy – this recipe is incredibly easy and it’s a great change of pace from the usual cranberry sauce! You might bring something like this to Thanksgiving to spice things up and to add just the right kick (of course you could use jalapeños if you can’t find poblanos). Mix them with some traditional stuffing ingredients – onions, celery, carrots, and sage – as well as some southwestern accents – scallions, cilantro and mexican oregano. And for a healthy kick, you can even sneak in some kale. And it just happens to be vegan and gluten free! If you’re not up for the traditional marshmallow/sweet potato situation, you can try this Chinese 5 Spice Sweet Potatoes medley! A simple recipe of cubed California sweet potatoes, tossed with olive oil, Chinese 5 spice, salt and pepper. Load it up with some freshly chopped chives and green onions before serving and it’s the perfectly balanced bite making it the perfect side dish for Thanksgiving! These Mediterranean Mashed Potatoes are a great vegan option and for anyone avoiding dairy! AND it’s a great last-minute side dish if you’re looking to quickly add something else to the table or buffet. Easy and delicious! This Hasselback Butternut Squash is slathered in a buttery garlic sauce while enhanced by a kick of cajun spices. You’ll be wanting to whip these up no matter what the occasion is and it’ll be the star of any table you put it on! If healthy is your game then you must give this Apple Sweet Potato Quinoa Salad a go! With it’s crunchy apples and pecans, roasted sweet potatoes, dried cranberries and quinoa, you’ll fall in love. A simple side dish that wins every time! Forget how you have been cooking carrots. With this recipe you don’t have to slice or dice your carrots. Make a statement on the table with these beautifully roasted carrots with minimal effort. Don’t forget about dessert! Normally, everyone thinks you have to go pumpkin for Thanksgiving dessert. This year you may want to try something new, like chestnut. Take a look at this recipe for a creamy chestnut cheesecake that is topped with a rum-y syrup. 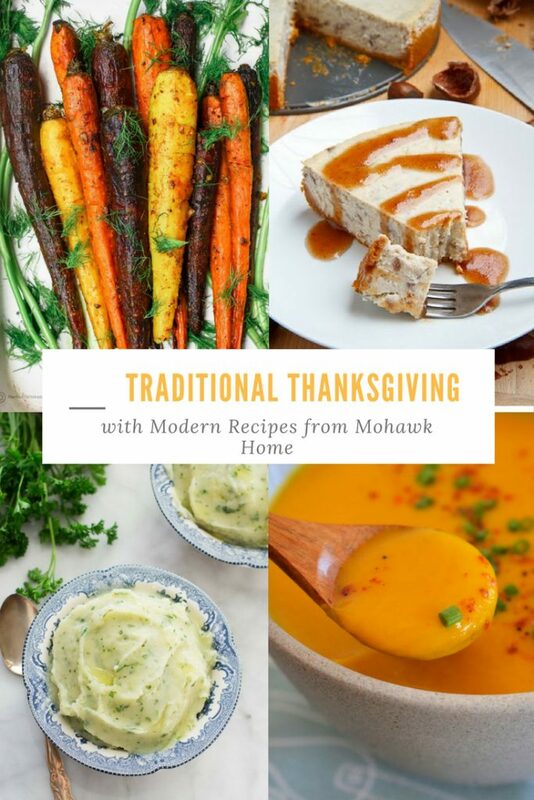 Have you updated any of your traditional Thanksgiving recipes? Share your favorites in the comments below so we can try them!